Grounded in critical heritage studies and drawing on a Pacific Northwest Coast case study, Maritime Heritage in Crisis explores the causes and consequences of the contemporary destruction of Indigenous heritage sites in maritime settings. Maritime heritage landscapes are undergoing a period of unprecedented crisis: these areas are severely impacted by coastal development, continued population growth and climate change. Indigenous heritage sites are thought to be particularly vulnerable to these changes and cultural resource management is frequently positioned as a community’s first line of defense, yet there is increasing evidence that this archaeological technique is an ineffective means of protection. Exploring themes of colonial dislocation and displacement, Hutchings positions North American archaeology as neoliberal statecraft: a tool of government designed to promote and permit the systematic clearance of Indigenous heritage landscapes in advance of economic development. 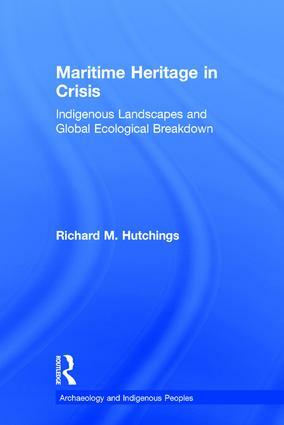 Presenting the institution of archaeology and cultural resource management as a grave threat to Indigenous maritime heritage, Maritime Heritage in Crisis offers an important lesson on the relationship between neoliberal heritage regimes and global ecological breakdown. Richard M. Hutchings is a founding director of the Institute for Critical Heritage and Tourism, British Columbia, Canada. Born and raised in Seattle, Washington, he obtained his M.A. from Western Washington University, Bellingham, and his Ph.D. from the University of British Columbia, Vancouver. He resides on Gabriola Island in the Salish Sea.